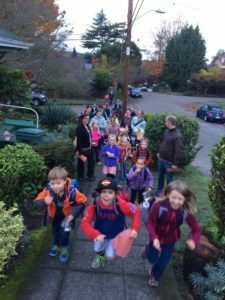 October is Walk to School Month, and we will be celebrating our many Bryant students who make their way to school on foot! Each Friday in October (Oct 6, 20, and 27) we will be hosting “walking bus stops” surrounding Bryant from 7:30-7:40 to gather with friends, have a treat, and walk to school together. 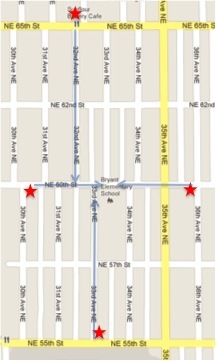 West Station 30th Ave. NE/NE 60th St.
South Station 33rd Ave. NE/NE 55th St.
North Station 32nd Ave. NE/NE 65th St.
East Station 36th Ave. NE/NE 60th St.
Live NW of Bryant? A walking school bus will run through the neighborhood, beginning west of Third Place Books, and make scheduled stops on the way to school. Contact Michele Solis for more details.